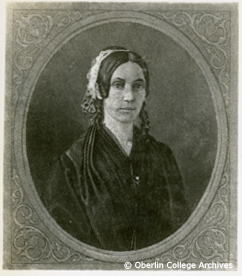 Emily Pillsbury Burke was born in Boscawen, New Hampshire in 1814 and moved to Oberlin following her husband's death in 1849 to accept her appointment as Principal of the Oberlin Female Department. As a young widow, Burke taught for several years in female seminaries in Georgia, where she strengthened her commitment to racial equality. Highly recommended by Reverend Samuel Aikin of the First Presbyterian Church of Cleveland, Emily Burke seemed a suitable fit for the position. Unfortunately, scandal rocked her tenure at Oberlin, and, less than a year after her appointment, Emily Pillsbury Burke was dismissed by the Ladies Board of Managers for allegedly kissing a male student. Following the incident, the Oberlin College Board of Trustees received petitions from students expressing concern over the potential harm to Emily Burke's reputation, especially considering her vulnerable social position as a widow. Burke, herself, wrote a letter to the Trustees, requesting the opportunity to defend her reputation; however, members of the Ladies Board objected. Many threatened to resign if their decision was overturned, claiming the Board of Trustees was second-guessing their judgment. Ultimately, the Board of Trustees upheld the authority of the Ladies Board and expressed full confidence in the abilities of those women to decide such issues. Emily Pillsbury Burke's story is unique. It not only provides a look into the administrative dealings of Oberlin College in the 1850s, but also allows a closer examination of the social climate of the College and town at the time. For instance, the dismissal of Emily Burke could be read as an example of the double standards exposed in the Declaration of Sentiments at Seneca Falls just two years prior. The Declaration lamented that man "has created a false public sentiment by giving to the world a different code of morals for men and women, by which moral delinquencies which exclude women from society, are not only tolerated, but deemed of little account in man. "1 While a faculty member kissing a student certainly creates a problematic situation, in Emily Burke's case, one wonders if the matter would have been handled differently had the faculty member been male and the student female. Writings by the Female Moral Reform Society in the 1850s suggest that sexual transgressions were judged more harshly in women that in men. In an annual report in 1835, fifteen years before the Burke scandal at Oberlin, the Female Moral Reform Society framed their "great object" as "the formation of a public sentiment, that will place the licentious man on a level with the licentious woman. "2 They go on to clarify: "We see no reason why either should be exempt from merited disgrace. When men are guilty of this sin, let them lose their character as women do." However, although female moral reformers wished for an end to this double standard, they would not have found Emily Burke's dismissal controversial. They supported the disgrace of those guilty of "licentiousness," whether they were women or men. Thus, although potentially troubling to modern feminists, the Oberlin Ladies Board's decision to dismiss Emily Pillsbury Burke fell within the ideology of first wave feminism as expressed by the Female Moral Reform Society. Despite its initial appearance, however, this case could also be viewed as a step forward for women in Oberlin. At a time when those in support of Emily Burke questioned the authority of the Ladies Board of Managers, the Oberlin College Board of Trustees reaffirmed and upheld the power of the Ladies Board and expressed confidence in the abilities of its members. One could interpret this decision and the support of the Trustees as evidence of growing support for women's intellect and agency in the Oberlin community. Likewise, although working to undercut the decision of the Ladies Board, the petitioners' reactions to the events surrounding Burke's dismissal indicate a similar trend. Those who called for an inquiry into her dismissal described Emily Burke as a capable teacher who had legitimately exercised her authority in the educational sphere, not simply a single woman whose livelihood depended on her reputation. They expressed confidence in Burke's abilities as an educator as well as pity for her situation as a widow. Assuming the petitioners were not misinformed about the reasons for Emily Burke's dismissal, perhaps they felt they had good reason to consider her the best possible head for the Female Department. The fact that supporters of both the Ladies Board and Emily Pillsbury Burke chose sides based on their belief in the capabilities of women further demonstrates Oberlin's growing respect for the role of the female voice in the 1850s. History of Woman Suffrage, Elizabeth Cady Stanton and Susan B. Anthony, 1881.